Behringer has announced Podcastudio FireWire, described as a complete podcast studio with FireWire interface. The podcasting kit comes with a studio-grade FireWire audio interface which includes the Behringer Edition of Ableton Live Lite 4 music production software for PC and Mac computers. 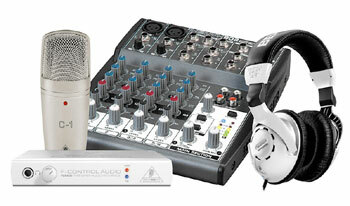 The package also includes an 8-input mixer, high-quality headphones and a studio microphone plus cable. Pricing is expected to be $269.99. You can’t have a “complete podcasting studio” without software to rrecord and edit VOICE. A live 4 is music creation software, and what about a feed-writer? I am interested in learning more about this. Details from Behringer are pretty sketchy at this point. We’ll ask our contact their to get us more. I’m also not so sure about using Live to record your podcast – it doesn’t seem like the best app for that. We have a large Behringer mixer for our home studio. I use Audacity as my recording software for my podcasts and also editing our podcasts and it is free! Ableton Live Lite 4 is a great selection of software that allows for audio production, be it a Podcast or a demo song. We feel it provides a good flexible solution to the largest audience of people who would buy this package, and it offers some great advantages that many Podcast only packages do not. The Podcastudio was developed as a package for the podcaster, as well as someone that wants to get a quick start at music production. For podcasting , there are many software packages available on the market, from Garageband to Propaganda and others that new producers will explore. Everyone eventually chooses software that fits their particular likes and production styles, because there is not a one package fits all solution. Thank you for your question, I hope this answer helped. Does the hardware for the Podcastudio FireWire work with Apple’s Garageband software? I know it comes with software, but I’d like to think I could use it with the software I have already got and have started using. Also, as a teacher, Garageband will automatically be on any Macs we use!